Let’s take a drive down meme-mory lane. 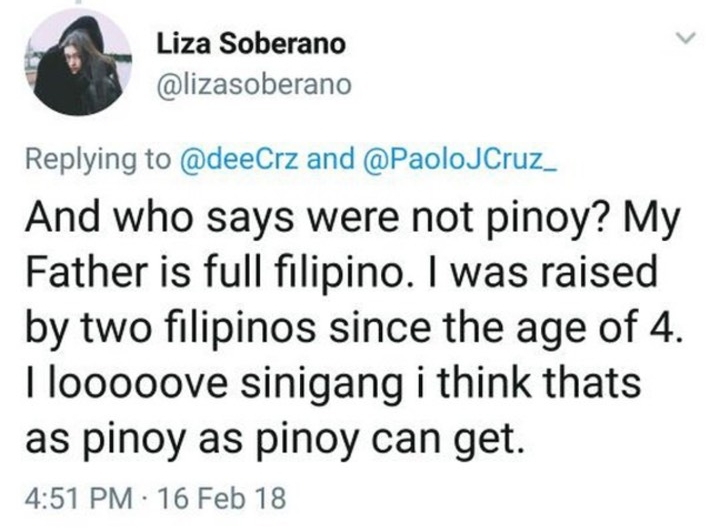 Remember last year when Liza Soberano sparked controversy after she defended the decision of casting foreign-blooded Filipinos in the fantaserye, ‘Bagani’? Well, that tweet not only launched a hefty dose of debates and opinions, but also a whole bunch of memes, thanks to her ‘I looooove sinigang’ statement. When liza soberano said "I looooove sinigang", damn I felt that ? But in the new promo for her upcoming movie ‘Alone Together’, Liza seems to have fully embraced the meme by finally responding to it – with a twist! The video features the 21-year-old and her co-love team, Enrique Gil, as she tries to guess the different types of sinigang in a funny taste test challenge. As for the result? Let’s just say she rightfully earned her title as the ‘Queen of Sinigang’.